Earlier this month, we released the XR Version 183 allowing for multiple card formats. As you may recall, this also requires the latest 734 Wiegand Interface Modules. We’re pleased to announce these modules are available now. In addition to the DMP card format, you can program up to seven different card formats for compatibility with what your customers are using. This greatly expands your flexibility to easily use a format that your customers are already using without replacing existing cards. The new larger and more powerful processor supports the additional memory needed for programming multiple card formats into the module. 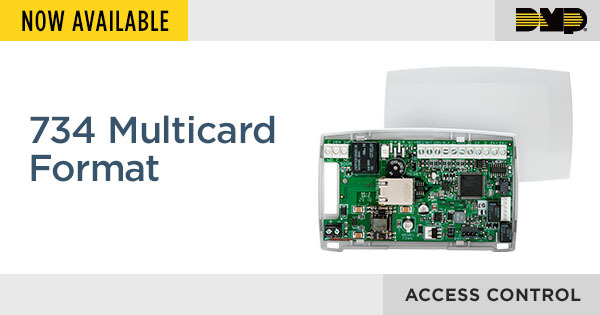 To see multiple card format options in the panel, you must update your XR150/XR550 panel to Version 183 firmware. Please review the information available in this Hardware Update. See also the updated 734 Wiegand Interface Module Installation and Programming Guide. If you have any questions, please contact DMP Inside Sales at 877-757-4367 or at InsideSales@dmp.com.